The latest reviewed version was checked on 4 July 2017. There are template/file changes awaiting review. In this lesson, you will learn basic greetings, the first nine Persian letters, connecting letters, and unwritten vowels. The dialogues in lessons 1 through 3 are shown in UniPers, a system of writing the Persian language in the Latin alphabet. In later lessons, the native Persian script is shown along with a transcription. Arash and Shirin are using a casual style of speech typically among friends. Later lessons will use various styles of speech, including some for more formal situations. The Persian language has six vowel sounds and twenty-three consonant sounds. Old Persian was written using its own cuneiform alphabet. Other scripts were used in later stages of the language, and eventually the Arabic alphabet was adopted. The sounds of Persian are different from Arabic, though, so four letters were added for Persian sounds that do not exist in Arabic ( پ ‹pe›, چ ‹ce›, ژ ‹že›, and گ ‹gâf›), and letters for several foreign Arabic sounds are pronounced like their closest Persian approximation. Thus, the twenty-nine sounds of Persian are written in the Perso-Arabic script, which has thirty-two letters and is called الفبا ‹alefbâ›, named after its first two letters (similar to "ABCs" in English). It is a cursive script, written from right to left like Arabic, opposite of the English direction. The letters are presented in the first four lessons of this book, followed by a summary of the whole alphabet in the "Alphabet summary" section of Lesson 4. Not all dialects of Persian are written using the Perso-Arabic alphabet taught here. 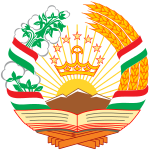 The Tajik (тоҷикӣ) language, spoken mainly in Tajikistan and Uzbekistan, is a variety of Persian written in the Cyrillic alphabet. The language diverged from Persian as spoken in Afghanistan and Iran as a result of political borders, geographical isolation, and the influence of Russian and neighboring languages. The standard language is based on the north-western dialects of Tajik, which were influenced by the neighboring Uzbek language. Tajik also retains numerous archaic elements in its vocabulary, pronunciation, and grammar that have been lost elsewhere in the Persian world. The first letter in Persian is ا ‹alef›. At the beginning of a word (on the right side), alef has two forms. The form on the far right here with the madde (the small "hat" on top: آ ) is written as a tall, vertical stroke from top to bottom followed by the madde on top written from right to left as a straight ( - ) or curved ( ~ ) line. This form represents a doubled alef ( اا ). It is pronounced with the long vowel sound /ɒː/ (IPA), transcribed here as ‹â›. That is, it has a long duration and is produced with rounded lips and the tongue low and far back in the mouth, like a slow version of the vowel in the Queen's English pronunciation of hot, American English caught, or South African English park. When the first letter of a word is alef without a "hat" ( ا ), it is read as a short vowel: ‹a› (IPA: /æ/) as in at, ‹e› (/e/) as in end or ‹o› (/o/) as in open, as will be seen in later examples. When alef appears later in a word (after the first letter), it is always written without the "hat" ( ا ) and it always represents long ‹â›. Decide whether the ‹alef› in the following words stands for (short) ‹a› or (long) ‹â›. You do not need to be able to read the whole word at this stage. To see the correct answer, click “[show ▼]”. Get out a pen and paper and practice writing آ ‹alef madde› and ا ‹alef›. Remember to write from right to left and to keep the base lines even. After alef ( ا ), the next four Persian letters, shown on the right, are all written similarly but with varying dots. Persian letters have names that begin with the sound they make, so these four letters make the sounds ‹b›, ‹p›, ‹t›, and ‹s›. The second Persian letter is ب ‹be›. It represents the /b/ sound. Its name sounds like a quick pronunciation of the English word “bay”. The Persian word آب ‹âb› (“water”) is shown on the right. In this word, the initial alef is written with a “hat” ( آ ), so it is read as long ‹â›. Persian is written from right to left and positioned on and around a horizontal baseline that is typically not visible on the page. The swooping stroke of ب is written from right to left and sits on that baseline, as does آ . The dot is below the baseline and, like the dot in the English cursive letter i, it is written after the connected strokes in the word. Like English cursive, most Persian letters in a word connect with each other, but separate Persian words never connect. For example, ب connects with the letter that follows it. Notice, though, that the letters in آب above do not connect with each other. That's because ا never connects with the letter that follows it. The line above shows ب in its “isolated” form on the far right, then in its “initial” form used when another letter follows, then its “medial” form used to connect it with letters on both sides, and then its “final” form used to connect it only to the previous letter. Notice that the upward-swooping tail only appears in the isolated and final forms. Many Persian letters have tails that behave this way. As the remaining alphabet lessons will explain, all but seven Persian letters connect with the letter that follows. As shown on the right, the swooping stroke of each ب connects with the following ا to spell بابا ‹bâbâ›, an informal word for “father”, similar to the English words “dad” and “daddy”. The other letters in this section are like ب in that each has a swooping stroke that sits on the baseline and connects with the following letter, and each has one or more dots that are written after all of the connected strokes of the word. Note that the alefs in بابا are not at the beginning of the word, so they represent long ‹â› and are not written with a “hat”. The third Persian letter is پ ‹pe›. It is pronounced as /p/ and its name sounds like a quick pronunciation of the English word “pay”. Its swooping stroke is written from right to left like the other letters of this group, then after the rest of the connected strokes of the word are written, the three dots of پ are written below the baseline. پ followed by ا spells the word پا ‹pâ› (“foot”). The letter ت ‹te› is pronounced like /t/ and is written with two dots above the swooping line. Its name rhymes with the other letters in this section. ت followed by ا spells the word تا ‹tâ› (“until”). Many Persian letters have one, two, or three dots. In most printed publications, those dots appear as diamond shapes, or squares, or circles. Groups of three dots are positioned in a triangle, and groups of two dots are positioned side by side. In fast handwriting, though, three dots are often written as a caret ( ^ ) and two dots are often written as a dash ( - ) or like a reversed tilde ( ~ ). The letter ث ‹se› is one of three separate Persian letters for the /s/ sound, since that is the Persian approximation of the letter's Arabic sound [θ]. In Persian, its name sounds like an abbreviated version of the English word “say”. It is used mainly in words of Arabic origin and is not a very common letter in Persian. As shown on the right, ث appears twice in the word اثاث ‹asâs› (“furniture”). Note the difference between a hatless initial alef pronounced as short ‹a› and an alef in the middle of a word, pronounced as long ‹â›. Get out a pen and paper and practice writing ب ‹be›, پ ‹pe›, ت ‹te› and ث ‹se›. Remember to write from right to left and to keep the base lines even. The next four Persian letters, shown on the right, are all written similarly but with varying dots. Notice that the tails in these four letters hook to the right. Recall that tails only appear in the isolated and final forms for letters. When another letter follows, the tails are not written, so these four letters lose their hooks when another letter follows them. The letter ج ‹jim› is transcribed as ‹j› and pronounced as [d͡ʒ] (i.e. like the English letter j in jump). The top stroke is written first from left to right above the baseline, followed by the lower hook extending counterclockwise below the baseline. The dot is written later, after any other connected strokes in the word. ج followed by ا spells the word جا ‹jâ› (“place”). This example shows that the shape of this letter changes when another letter follows it. The top stroke is still written from left to right, but a simple right-to-left stroke along the baseline replaces the hook when another letter follows. The other letters in this section change shape similarly when another letter follows. The letter چ ‹ce› is transcribed in UniPers as ‹c› and pronounced as [t͡ʃ] (i.e., like ch in English church). The letter ح ‹he› is pronounced as /h/. Its name sounds like a quick version of the English word “hay” (that is, it does not sound like the English word “he”). ح followed by ب spells the word حب ‹hab› (“pill”). You probably noticed that the short vowel ‹a› is not represented in حب ‹hab›. That is because Persian makes an important distinction between short and long vowels. The short vowels (‹a›, ‹e› and ‹o›) are not usually written in Persian. When you come across a new word in writing you might have to find out how it is pronounced from a dictionary or someone who speaks Persian. Although there is a system of marking vowel sounds (see Alefba), it is only usually seen in children's books, because it disrupts the normal layout of text. In contrast, long vowels have their own letters and are written down. More details about writing and pronouncing vowels will be presented in the Lesson 4. The letter خ ‹xe› is pronounced like the IPA sound [x] (like the Spanish letter j or the German ch), transcribed in UniPers as ‹x›. خ followed by ا and ج spells the word خاج ‹xâj› (“cross”). Like the previous few letters, the tail of خ is not written when another letter follows it. Get out a pen and paper and practice writing ج ‹jim›, چ ‹ce›, ح ‹he› and خ ‹xe›. Remember to write from right to left and to keep the base lines even. Decide whether the ‹alef› in the following words stands for (short) ‹a› or (long) ‹â›. You do not need to be able to read the whole word at this stage. What are the names of and sounds represented by the following letters? The letter ‹jim›, which represents the sound ‹j› (IPA: [d͡ʒ]). The letter ‹alef› without madde, which represents the long vowel sound ‹â› (/ɒː/) in the middle or end of a word, or a short vowel sound (‹a›, ‹e›, or ‹o›) at the beginning of a word. The letter ‹se›, which represents the sound ‹s›. The letter ‹te›, which represents the sound ‹t›. The letter ‹be›, which represents the sound ‹b›. The letter ‹pe›, which represents the sound ‹p›. The letter ‹alef›, without a madde, it represents the long vowel sound ‹â›, or at the beginning of a word, a short vowel sound (‹a›, ‹e›, or ‹o›). The letter ‹xe›, which represents the sound ‹x› (IPA: [x]). The letter ‹he›, which represents the sound ‹h›. Which sounds have no letters of their own in Persian? Short vowels usually are not written in Persian. Which four letters were added to the Arabic alphabet by Persians to represent sounds which do not exist in Arabic? پ ‹pe›, چ ‹ce›,ژ ‹že› and گ ‹gâf›. Read these words by breaking them down into their component parts. In this lesson, you learned some greetings, the first nine letters of the Persian Alphabet, and how to spell several words with those letters from right to left. You also learned that short vowels are usually not written, and that many letters change their shape depending on whether they connect with letters before or after them. This page was last edited on 13 October 2016, at 00:16.